Some good advice on caring for an antique sculpture and maintaining the surface or the patina of sculptures and statues of stone, bronze, spelter or lead. Whether you keep them indoors or outside, proper care should be an owners top priority. The careful positioning of outdoor sculpture in a sheltered position is the first step to practical conservation. Water dripping off a tree will stain a statue placed beneath and mould, algae and lichen form more readily on objects exposed to northerly weather. In extreme cold stonework can split or shatter as moisture absorbed by the stone expands and contracts with freezing. Removing soil from urns and troughs will reduce the danger of frost damage. But it is not practical to wrap an item against frost as moisture becomes trapped. Outdoor pieces can be raised above ground level on plinths with built in damp proof membranes. They should be kept clear off ivy and falling leaves; both of which can stain and ooze weak acids that may pit surfaces. Always cover all antique sculpture and statues before spraying garden chemicals anywhere near them. Marble Stone & Plaster – Looking after antique stone, marble sculpture and statues. Some stone dissolves or is irreparably worn away by misguided attempts at cleaning. Limestone, sandstone and coade stone form a weathered surface crust which if removed will expose a vulnerable crumbly surface beneath. If the surface is smooth and hard you can lightly hose it with water, easing loosened dirt with a soft bristled brush. Algae and lichen do little harm, and in most cases add to a statues value, but can be removed if the surface is sound by brushing with a solution of one teaspoon of dichlorophen, (available from most good garden shops), to one pint (570ml) of water. Alabaster and marble are porous and stain easily, and marble discolours and deteriorates particularly in salty or polluted air. Attempts to remove stains from any porous stone may force the stain deeper or erode the surface. Alabaster and soap stone are very soft, easily scratched and broken, and gradually dissolve in water and should be dusted regularly to prevent a build up of dirt. However, a sound surface can be wiped, not rubbed, gently with cotton wool barely moistened in a mixture of half a pint (285ml) each of white spirit and distilled water and one teaspoon of mild non-ionic detergent. Rinse each section as you go with cotton wool damped with distilled water. The solution is also suitable for cleaning hard stone such as a polished granite, onyx, blue john, jade and agate. Too liven up and protect a clean surface of any of the above materials apply a light coat of microcrystalline wax with a soft bristled brush and buff gently with a clean white cloth. White marble and similar materials can be dusted with pure talc to fill the pores and prevent dust becoming ingrained. Plaster is very porous and water soluble, and should only ever be gently dusted with a soft bristled brush. Major repairs or the restoration of stonework should always be carried out by a qualified professional, who will use a special resin compound mixed with ground up stone to match the object. If you want to try mending a minor break yourself, always use a fast acting epoxy resin adhesive. Tips on looking after bronze, spelter and lead, figures and statues. 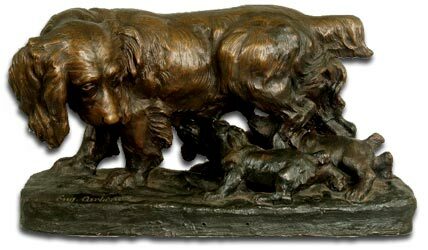 The dark or greenish brown patina that forms on bronze is highly desirable and should be preserved; so don’t use metal polish or solvents on any bronze or any water on indoor bronzes. Dusting alone should suffice. A dull patina can be revived by a very light coating of microcrystalline wax. Always make sure you test an inconspicuous area first to ensure the patina is stable as an artificially induced or painted patina may not be stable. Apply the wax with a soft bristled brush and burnish gently with a soft cloth. Archaeological bronzes or items that have been exposed to salty air may develop ‘bronze disease’ – small powdery green spots on the surface. You can wax a small area immediately but anything more serious should be taken to a conservation specialist or professional restorer for specialist treatment. Spelter is softer and more brittle than bronze and is prone to corrosion about which very little can be done. Figures are often thinly cast and fragile, so alwyas make sure you hold them at the most solid part. Painted or gilded figures should not be allowed to get wet but should only be dusted lightly with a soft haired artists brush. Unpainted spelter can be waxed as per bronze above. Lead is heavy but very soft, easily dented and scratched. It is also poisonous so always wash your hands after handling. Corrosion appears as a white powdery coating. Dust indoor lead regularly. A sound surface can be cleaned with a soft bristled brush or cotton wool moistened in water with a few drops of non-ionic detergent added. Rinse immediately and dry well. Microcrystalline wax helps to prevent further deterioration: apply one or two coats (leaving an hour between each) and buff gently with a soft cloth.